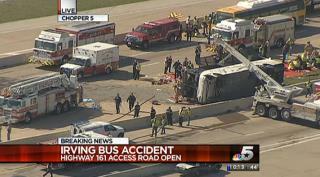 (Newser) – A charter bus carrying many "older folks" rolled over on a Texas highway around 9am, the Dallas Morning News reports. The bus was en route to an Oklahoma casino when it reportedly hit a "rubber traffic control item" on the right side of the road, cruised across the lanes and hit a concrete barrier, then flipped; a state trooper says 34 people were inside. Rescue crews have managed to get everyone out of the bus, but 16 people are in critical condition, and the local CBS affiliate is reporting that two people were killed. I got happy for a second and than realized it's Seniors not Senators. Man, they got dealt a seriously bad hand.